Simple and easy to set up, supporting multiple roles and all of the boats. Boat to use: What boat to play pest control in. Defend: Defend the knight! Will stay at the knight all game killing monsters around him. West/East/South West/South East: Always attack the selected portal, will move on to defending the knight if the portal is dead. Unprotected: Attack the next attackable portal until the game is finished. Attack any monster: Will just search for any attackable monster and attack it. Use special attack when at x%: Will enable special attack when the percentage is reached. Use quick prayers: Will enable quick prayers whenever it has prayer points and is in combat. Stop after points: Will stop the script after the points have been reached. Be aware that this is total points and not points gained in the botting session. Alch inside boat: Enable this if you want to alch inside the boat. Simply enter the name of the item you want to alch. If you have a fire staff in your inventory it will equip this to alch. Makes sure you have fire runes/nature runes. Got this doing hard oat attack all. Does this error actually stop the script from working? It shouldn't namely. @yasper It throws up a dialog box and says there was an error and if I click close box script stops, if I leave the box alone it runs the script. Also caught it a few times on the hard boat attempting to attack NPC through a closed door. Yeah this is due to the SDN obfuscating parts of the script that mess with the set up. Will be fixed soon. What role were you playing for this? working well in medium boat, my test acct isn't 100 combat yet to test vet boat. Feel free to use this in op if you'd like to. I'll try to get another one when it hits around 1250pts for full set and 3 helms. Woah great progress report thanks for sharing! @Yasper after watching this run for a bit, It runs completely around when the doors are close to which ever direction portal is chosen. example, west portal, medium boat, it will run to the doors and attack a npc, if someone closes the door, it will run around to which ever door is open at the time till it reaches the west portal. It seems it isn't checking if nearest door is open or closed. I've watched it run clear to the east gate and all the way around to the west portal 4 games in a row. I've switched to just attacking anything for now. Not sure if this is an issue or the way you intended it to be. 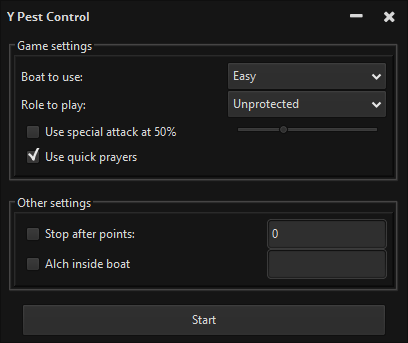 New version on the SDN (when it gets accepted) has the option to enable quick prayer when fighting monsters! @lostrapier what boat are u on? java.lang.IllegalArgumentException: No enum constant nl.yasper.pestcontrol.90.9.